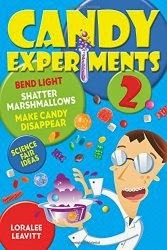 What do romance novels have in common with candy experiments? They're both full of sinking and rising hearts. Cake Mate hearts float nicely for a few minutes when you put them in water. As they do, they dissolve, shedding bright red sugar solution. The solution, denser than pure water, sinks. I can feel my heart rising already, can't you?